The situation is so common, many people decide to just ignore it: walk out to your garage, press the button on your remote to open the door, then cringe at the squealing sound that accompanies the motor bringing your door up. There are a variety of issues that can cause these problems, not the least of which are broken door springs. With a broken spring, noisy openings are just the beginning. Further deterioration can lead to your door becoming inoperable, which can easily ruin your day if you’re trying to get to work and can’t get your car out of your house. From extreme weather conditions to lack of maintenance to general wear and tear, springs can break for a variety of reasons, and wreak havoc on your livelihood in the process. No need to worry though, you’ve come to the right place. We are Garage Door Experts! Garage Door Pros’ staff of experienced and certified garage door technicians are well-versed in all aspects of garage door springs. Whether the problem requires repair or full replacement, we will assess your situation and come up with the best and most inexpensive method for getting you back on the road. As time goes by a broken spring on your garage door will be sure to happen. Extended use of your garage door causes strain on the springs and they eventually break. We have some of the best quality springs in stock and will have them installed for you in no time. 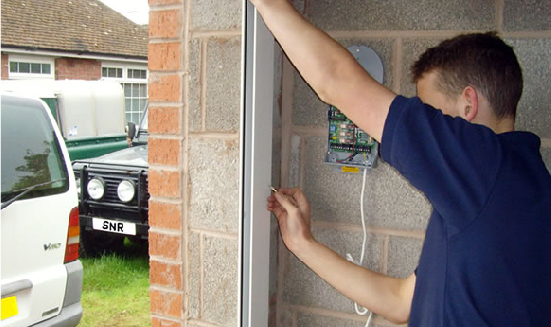 Parts of your garage door should be maintained on a regular basis to prevent any harm to you and your vehicle. A garage door with a broken torsion spring can fall rapidly and cause injury or death. Investing into high end torsion springs is a great way to spend your hard earned money. There are signs to look out for that will signal torsion springs that are nearing their end. Squeaky springs are often the first sign of springs that are quickly wearing down. Eventually you will hear the squeak become very loud and unbearable as time goes by. The average spring life is 7-9 years, which equals to 10,000 cycles at 4 cycles a day. If you use your garage door more frequently you can cut that time in half. 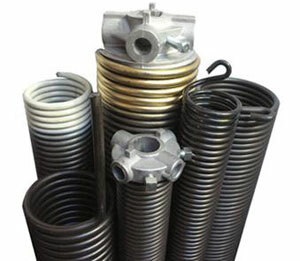 There is a wide range of options for you to choose from when it comes to the selection of springs available. Choosing to have your torsion springs installed professionally will make a huge difference. Fix your torsion springs or extension springs today and stop procrastinating! Garage door parts often seem to have a chain reaction when it comes to its functionality. One bad part will cause strain on other parts of your garage which will eventually lead to a breakdown. Knowing which parts are not working their best will give you a major advantage ahead of time. We have the tools needed in order to get the job done for you in no time at all. There are many ways to get the job done yourself but it isn’t recommended. If the garage cables appear to be broken that is a signal that your torsion spring is coming to an end. If your garage door has two torsion springs, the second spring will keep your cables tight. and on the drums. You will have to look up at the springs to determine if one is broken. Another thing to look out for is a bend at the top of your garage door. This often signals that your springs are no longer pulling the door fully in. You will be surprised at how many other problems you will run into if you don’t have good springs installed. Nos is the perfect time for you to find a reliable source who will gladly help you achieve success. There is no reason why you should skip out on installing the right torsion springs for your garage. The last and most important thing you should look for is jerky motion. You might have one broken spring on a two spring system. This can cause your garage door to open uneven and is not a great way to start the morning. With the holidays approaching and the winter season coming near now is the time to fix your garage. Imagine waking up one morning to broken springs that prevent you from leaving your home. The number one thing that you want to prevent from happening is your garage door spring breaking. This will cause everything to go crazy. The cables will become twisted if they catch on the edge of the sliding track. A lot of force comes down when a garage door spring finally breaks. Instead of replacing your entire garage door system you can easily repair a thing or two first. If you want to work with the best give us a call to repair your garage door fixed in a timely manner you won’t be disappointed. Homeowners in Fort Lauderdale in need of the right garage door repair often come to us. Broken springs on a garage door is absolutely nothing to play with! The best advice we can give is to not open your garage door until professionals take a look at it. As stated before you will risk injuring yourself and others if it decides to collapse. While we don’t recommend lifting the door when the spring break's we do know that there are cases where you may need to. If you absolutely must open up your garage door you will need two to three people in case it opens lob sided. Once you get the door opened up use vise-grips or a c-clamp on the track. This will keep it in place while you unload and remove what’s needed.